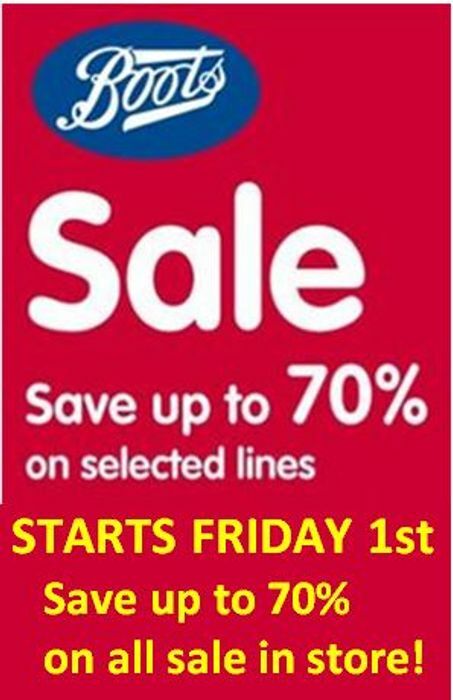 Boots 70% Sale Is On! DON'T FORGET the boost to 70% off is in-store only. Off to boots I go then! Why does the Soap & Glory not keep until Xmas - is there a use before date? Hope there is some stuff left when I go over the weekend! KayleighGeddis...I was at our store not far from Sheffield Wednesday ground, it's a small Boots store,I got there minutes after the 9am opening,it was mostly women with about 2 men.. I couldn't believe my eyes there were people with not one but two MASSIVE Blue Boots bags FILLED up with alsorts of bargains, I only took what I needed for my sister Ruth's family & mine.. I go by the mantra... It's nice to get a bargain BUT LEAVE SOME FOR OTHERS..!! We were a well behaved crowd,I passed a few items to people who were behind me as did other people.. I replied Look how polite we are passing things over to people at the back,a lady turned round & said "If this was Meadowhall there would be stuff chucked all over"
Went to my local around 9.30 am ...rows and rows of full shelves but very busy ..couldn't get round most of it but managed to get £200.00 worth for £60 . Birthdays and some Christmas covered. I went to our store around 3pm, some shelves were already empty, whatever was left- not much to choose from, but still got some make up gift. Unfortunately there was only one shelf with discounts which was well cleared by the time I got there.